The air in Provence, is just a little cleaner, once you get there. As we drove through the 100 tunnels (or more) between Genoa and Nice, me gripping the sides of the seat as Nico confidently swerved with an air of a Frenchman who has become an Italian driver. We arrived safe and sound, after I said ‘can you drive a little slower’ about twenty times, probably a guy’s worst nightmare, seated next to a self-admitted backseat driver. Our first stop for a wedding weekend in the Tuscany of France was the town of Grasse, decided at a moments notice, but mainly because we needed to stop for lunch. Grasse is the fragrance capital of France, but likely the world. 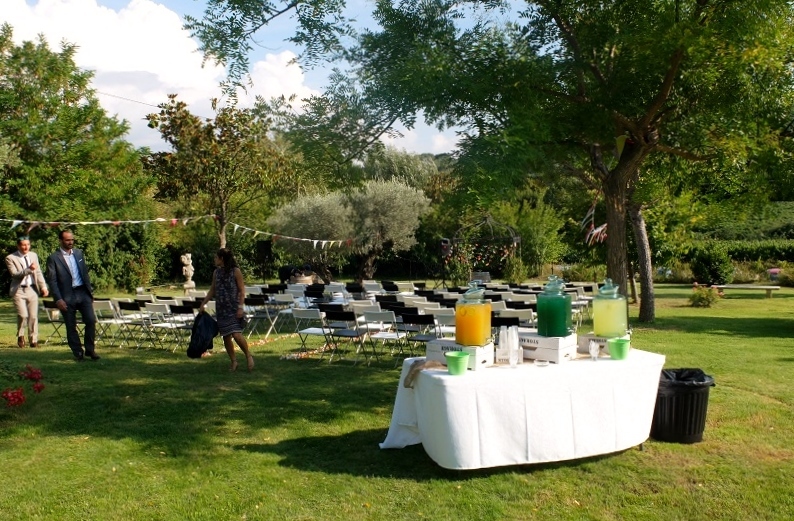 Nestled closely to popular cities like Cannes and Nice, this is definitely more of a countryside escape, the higher altitude allowing for a bit more breeze in the summer than its beach counterparts. I can see why Queen Victoria and Napolean’s sister took a liking to the place. 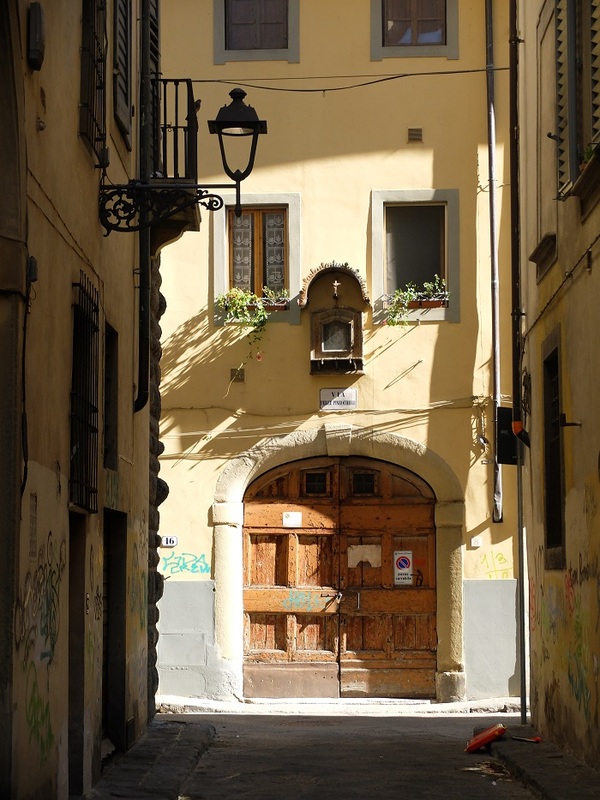 We wandered through the old town, a bit weary in some areas and glittering in others. ‘Perfume’ stores can be spotted anywhere you can look, and it all began with the popularity of perfumed gloves in the 16th century. Since before it became known for scents, this was a bustling leather and tanning town. Apothecaries and perfumeries began settling here in the 17th century and this became the place to get your perfume made. The area is surrounded by jasmine, centifolia-rose, mimosa, orange-blossom and violet fields – but many of these place use essential oils from blooms sourced in other areas, like Bulgaria. Nico told me about ‘le nez’ or what is known as ‘the nose’ experts who can distinguish over 2,000 types of scents, with just a sniff, and are treated almost like gods. 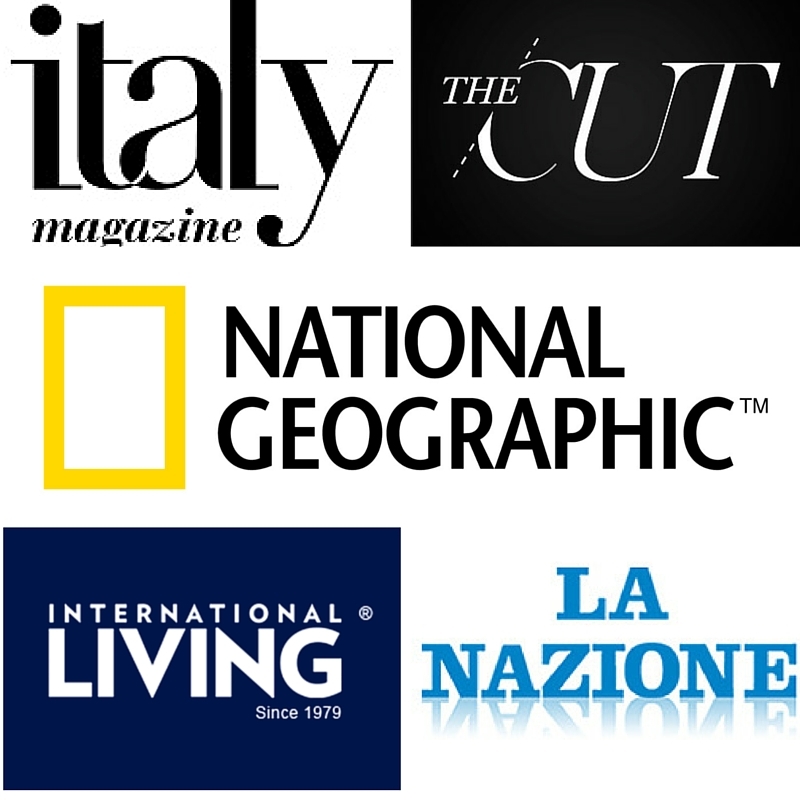 You can read more about them and the industry via this great blog post by Rebecca Marshell. We only stayed for lunch, a little spot in the main square, our first glass of rose’ after a long drive from Florence. 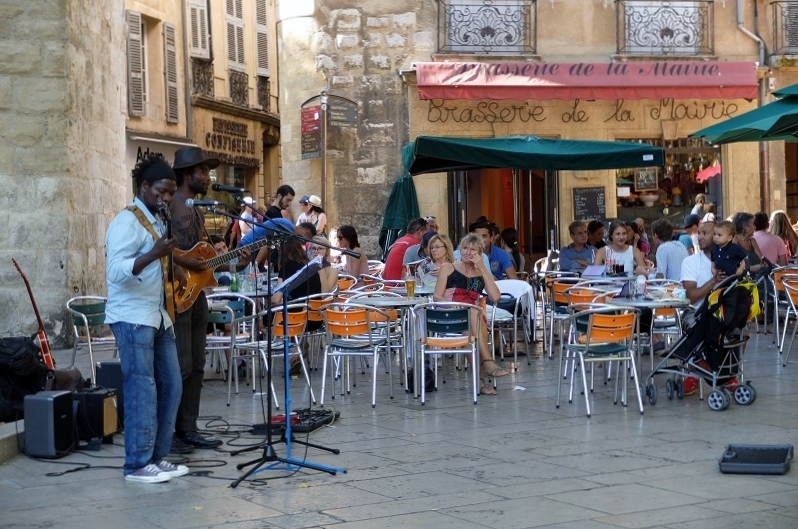 Next stop is a town I’m sure you’ve heard of Aix-En-Provence, the birthplace of post-impressionist painter Paul Cézanne and a place popular with many Americans seeking to experience a bit of that Provence dream. You can even follow in Cézanne’s footsteps and head towards Sainte-Victoire. 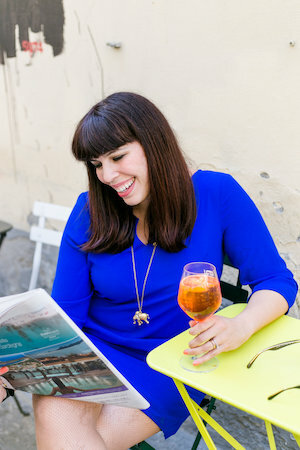 A place for dreamers, foodies and art lovers — one notable stop would be to see Nicolas Froment’s 15th-century Burning Bush triptych, restored in Aix’s St Sauveur cathedral. Since it is the kind of spot that is best described through photos, here we go. For a good 36 hour guide to the city, I thought this one by Telegraph was good. Our plan was simple, we didn’t have one. Since this weekend was just about enjoying the moment, and more importantly celebrating two good friends of Nico’s wedding, I was more than down to just stroll, and I’m rather happy we did. 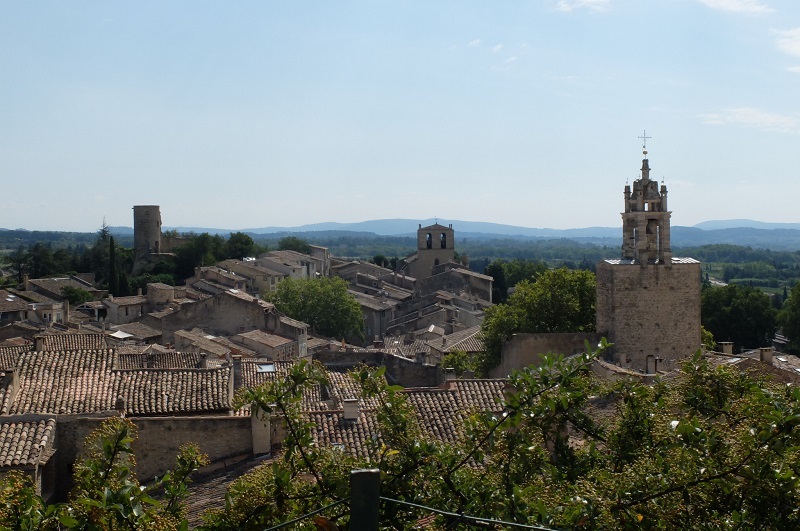 This place is beautiful, not my favorite city in Provence, because I found Cucuron and Lourmarin even more charming. 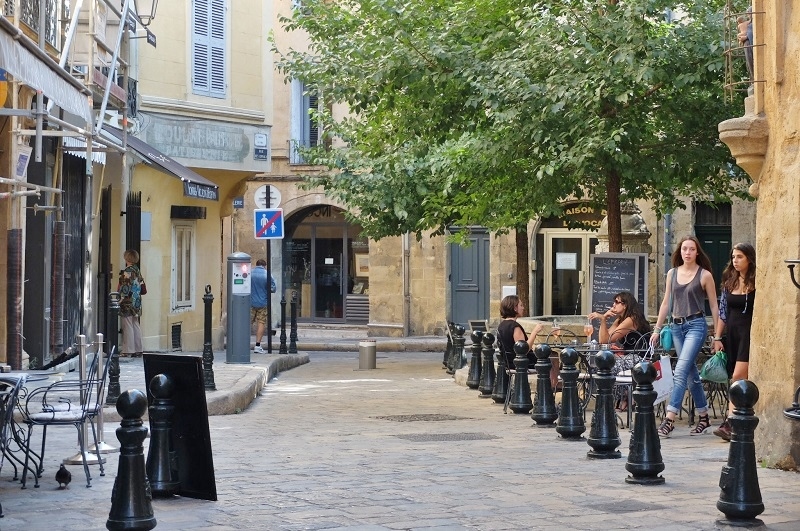 Every street is quaint in its own, unique way, my advice is to start from Cours Mirabeau and make your way around the town with no real itinerary in mind. From the fountains where you can spot rose chilling underneath the cool waterfalls, to the plaques commemorating famous artists or nobles who made this town their home or events that occurred during WWII. The funny thing about the above photo, is that after I posted this on instagram, the owner of the house found it and commented. I am sure I am one of 100,000 girls who posed by this location. Live music in the main town hall square. Every Tuesday, Thursday and Saturday morning there is a flower market. This is clearly the best spot for people watching. 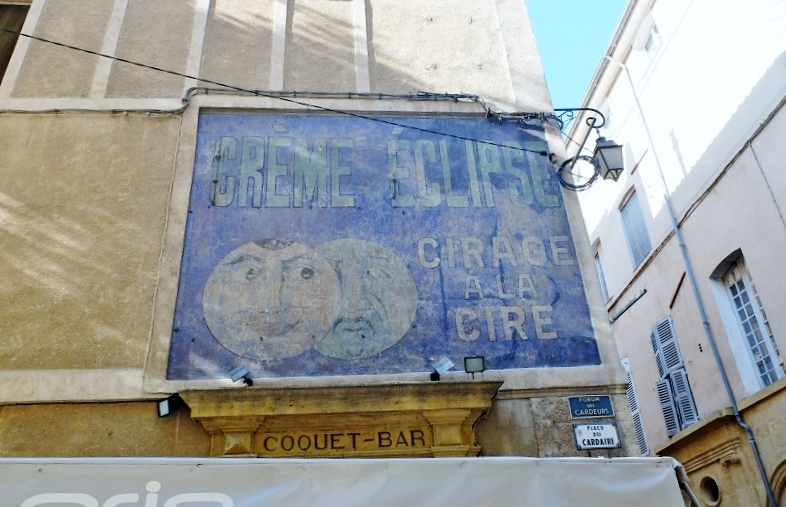 One of our favorite things about this town were the old-painted wall adverts that you can spot everywhere. This particular one was advertising wax polish. 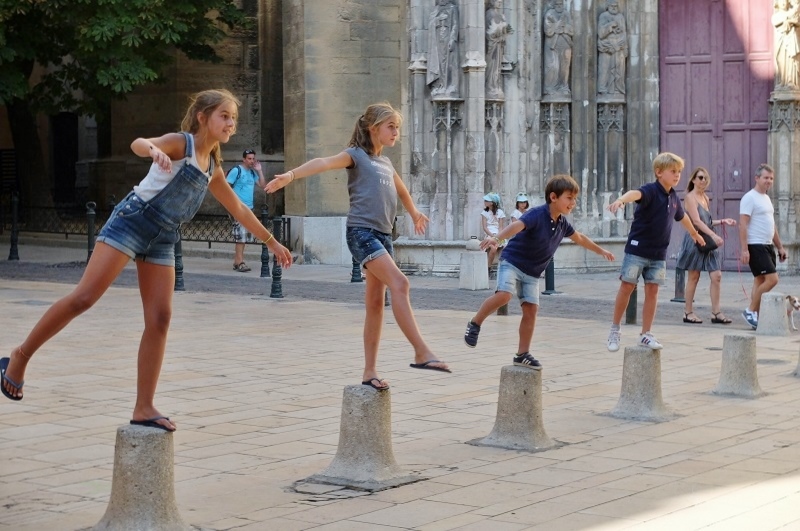 A cute family practicing the art of balancing in front of the Roman Catholic cathedral and the seat of the Archbishop of Aix (built upon ancient Roman ruins). We saw many a selfie here, luckily not us ;-). Stopping to look at some local desserts, ‘calissons’ are king here, an almond candy topped with royal icing. It is very good (but an acquired taste) and can be found in shops like these all around town. The irony about this candy is that it is said to have come from Medieval Italy, the first known references to calissons was in Martino di Canale’s Chronicle of the Venetians in 1275. Seems we cannot escape Italy even for a weekend. 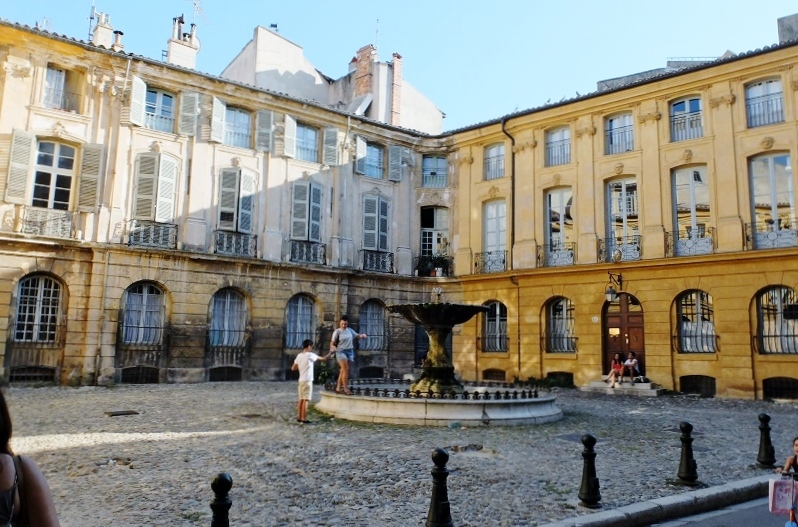 The beautiful Place d’Albertas, an 18th century square that looks straight out of Paris (in fact that is how it was designed to represent). 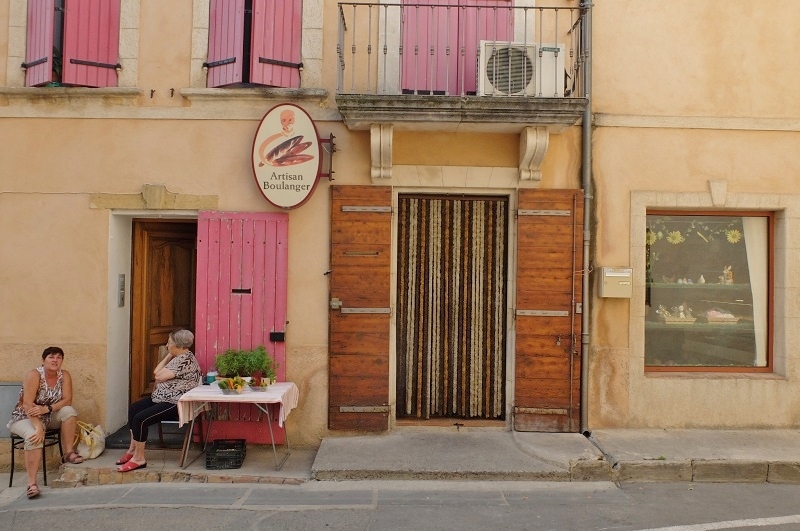 We left Aix-En-Provence after a few hours of walking since we had a wedding the next day and wanted to settle in our Airbnb apartment in the charming town of Cucuron, only about 4 kilometers from Lourmarin. I was quite excited to be in such a tiny, beautiful spot that was featured in Director Ridley Scott’s 2005 movie entitled “A Good Year” with Russel Crowe. 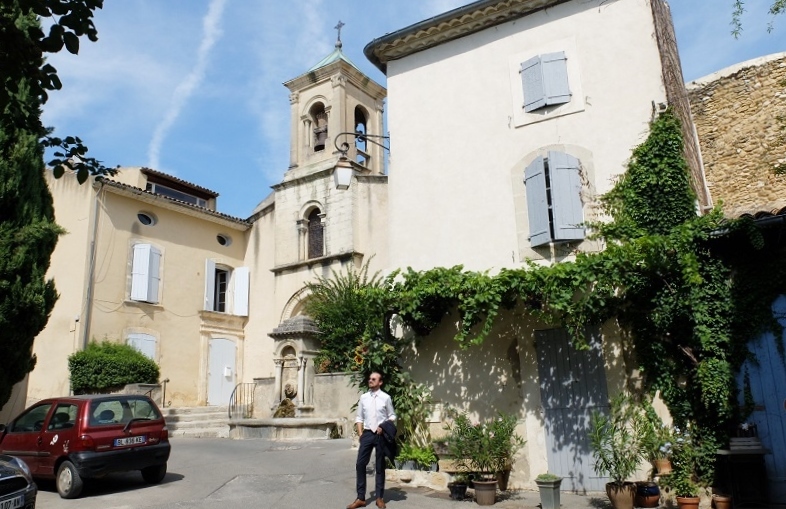 Well known for a superb restaurant, La Petite Maison de Cucuron, known for the creative Michelin star chef Eric Sapet who makes region delights with a twist. The area reminds me a lot of Tuscnay, surrounded by vineyards and olive fields, with several cooperatives selling their wares here, we indulged and bought a box of wine from Viticultural cooperative wine shop where you can get decent Rose for very affordable prices. The panorama of this town, with less than 2,000 people living here. Its history dates back to the neolithic period. It was hit hard by the plague in the early 18th century. 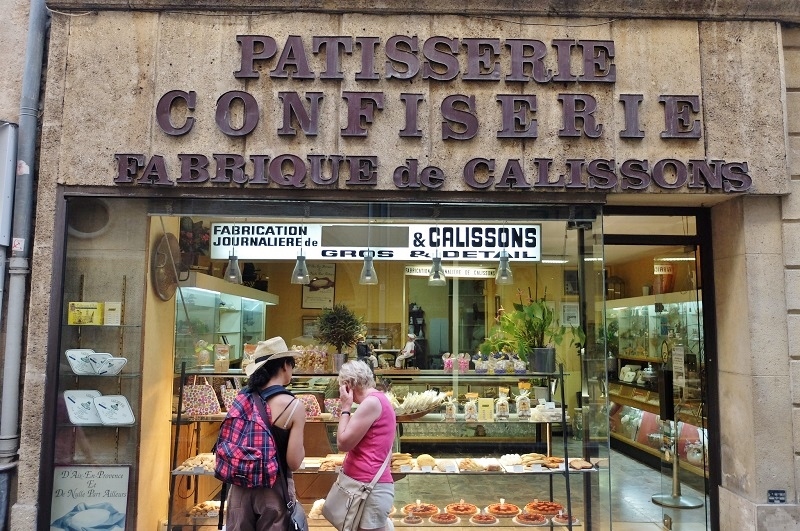 Your typical ‘boulanger’ or bread shop. We would walk by in the morning and always see ladies like this sitting in front, having a coffee and sharing a bit of morning gossip. 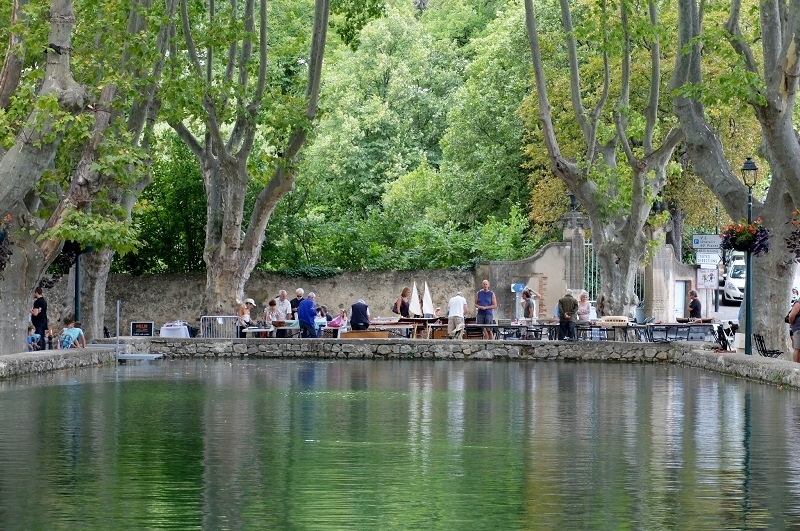 The Bassin de l’Etang or town basin is spring-fed and dates back to the Midieval ages. 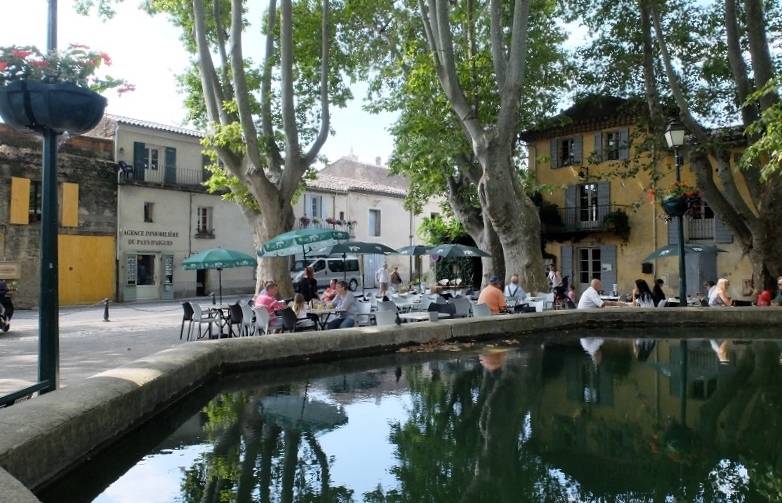 A beautiful spot where you can sip a coffee and just revel in what a charming part of France this truly is. Every Tuesday, a bustling food market takes over the area. 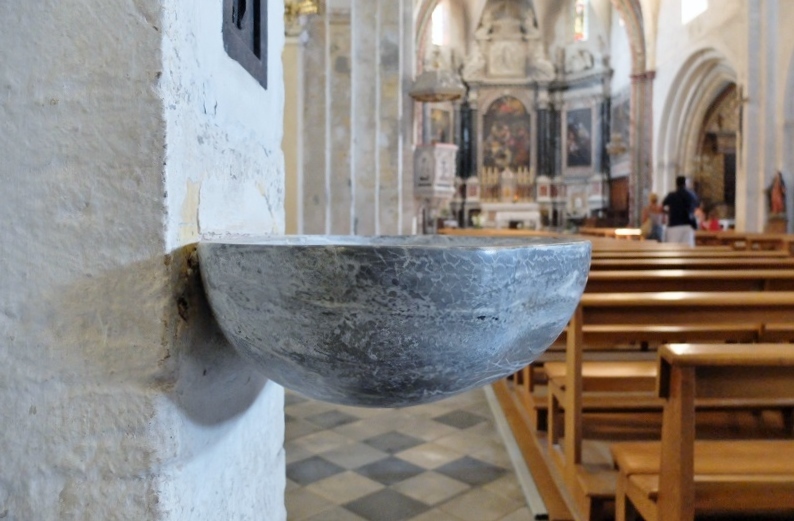 Inside the Cathédrale Sainte-Anne, which dates back to the 13th century. 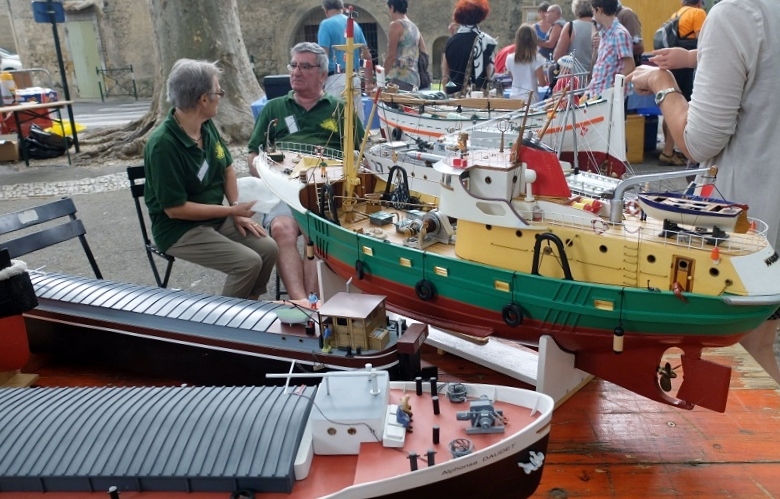 We caught a special market the Sunday before we left, with model ships from all over France taking over the square to show off their intricate detail. It was really quite cool, I wish my dad could have been there as he would have appreciated something like this. This was the town where Nico’s friends Francois and Marie were set to get married. We didn’t get a chance to visit much but we had a wonderful in the tiny, beautiful streets before the afternoon ceremony at the town hall. Here, there is a charming Romanesque church and a castle from the 15th century built by the Agoult family. It was also known as a place for artists, including Henri Bosco and Albert Camus who are both buried in the cemetery. Also home to excellent AOC Côtes du Luberon wines, in fact our friends got married in a vineyard nearby which meant we got to indulge in a bottle or five. Wine is good for the heart right? Naturally Nico had to bring a little Italian style to the wedding, in fact his shoes were the best I spotted there. And yes, I am quite biased. Nico and I before the wedding, I bought this gold lace dress from Coin and Nico rocked a pink tie, wedding in Provence here we come! 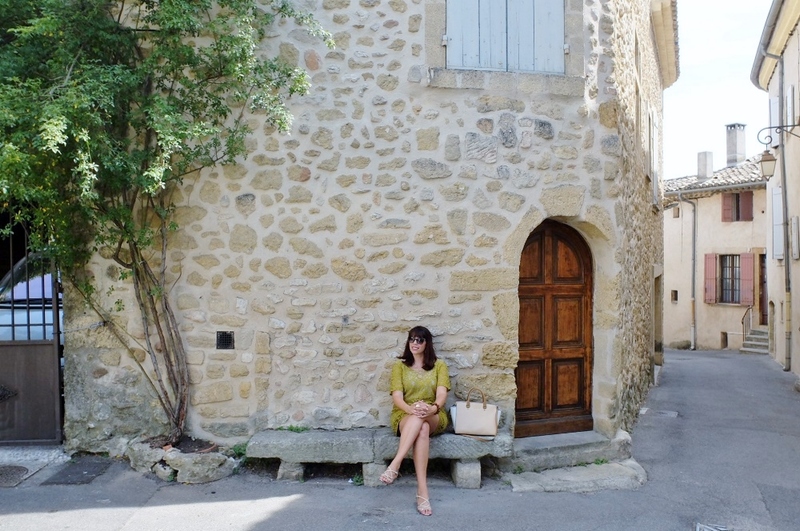 Outside the town hall in Lourmarin. What made this so special is how long everyone had known one another. 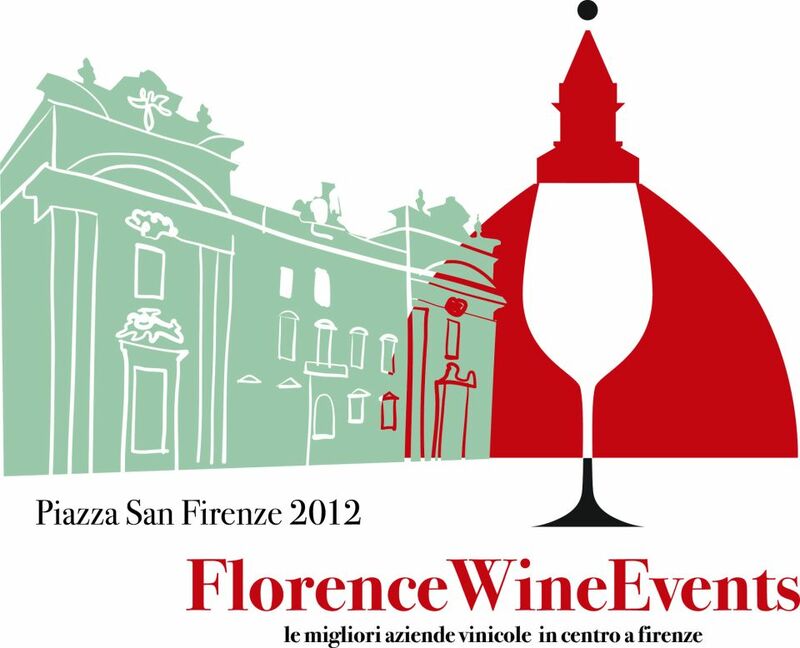 Far from the cold, quick receptions I have seen in Florence, this was anything but. The major gave a long speech about Francois (who comes from this village) and how he loved sports and managed to crack up the crowd. Though my French is still quite limited, it was such an experience. The love is there, this is one of those couples that everyone adores, the kind you never second guess, that seemed destined from the start to be together. 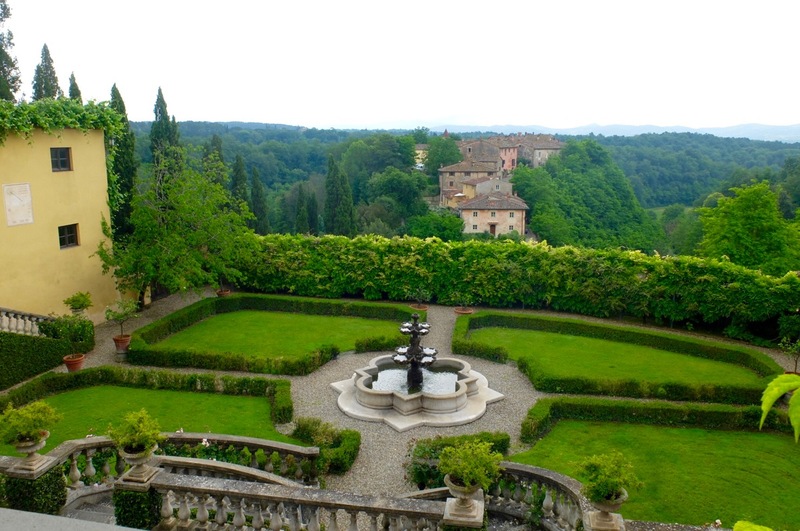 The wedding reception took place at nearby Château Turcan, known for its museum of wine, an extremely beautiful spot. Everything about it was perfect. From the cold juices served before the symbolic ceremony, to the pretty flags strung over the seats. I’ve said it before, and I’ll say it again. 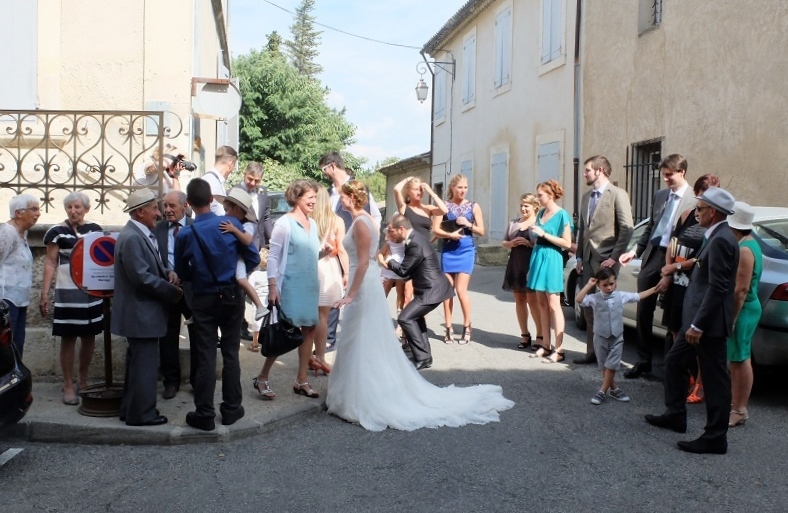 French weddings are awesome. One touch I thought was quite unique was the fact that every single guest brought a bottle of wine, with a written message, a touching addition that will be remembered with every sip for the couple. We grabbed champagne and mingled with everyone, many quite young and already married, or pregnant. Most of them were friends that Nico had made in engineering school, a process that when he describes it, feels a little like what I imagine the Navy Seals (kidding) have to go through, only keeping it purely intellectual. 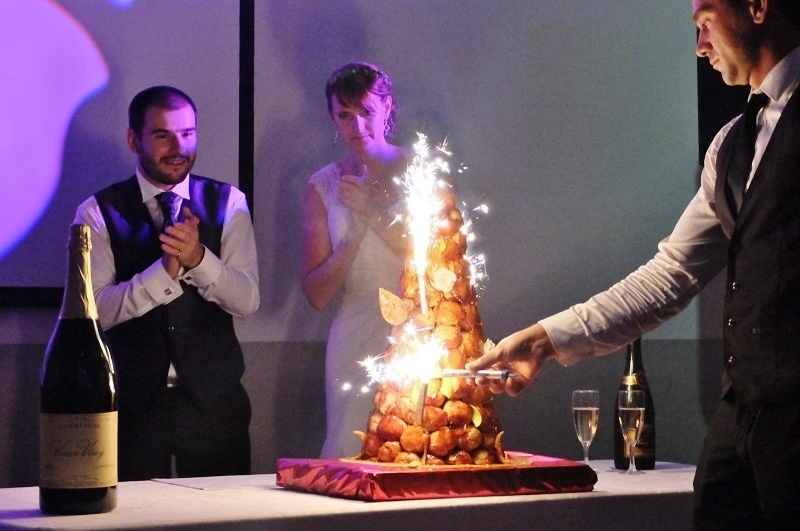 As we danced until the wee hours, the pregnant girls completely lasting longer than us on the dance floor, I finally got to witness my very first Croquembouche, a word that I still can’t say, but that is the coolest thing I’ve ever seen. It consists of choux pastry balls piled into a cone and bound with threads of caramel. And yes, they set it on fire. As you do. France, I knew I loved you for a reason. Wow, what a fab weekend! You gotta love a good wedding. Absolutely! 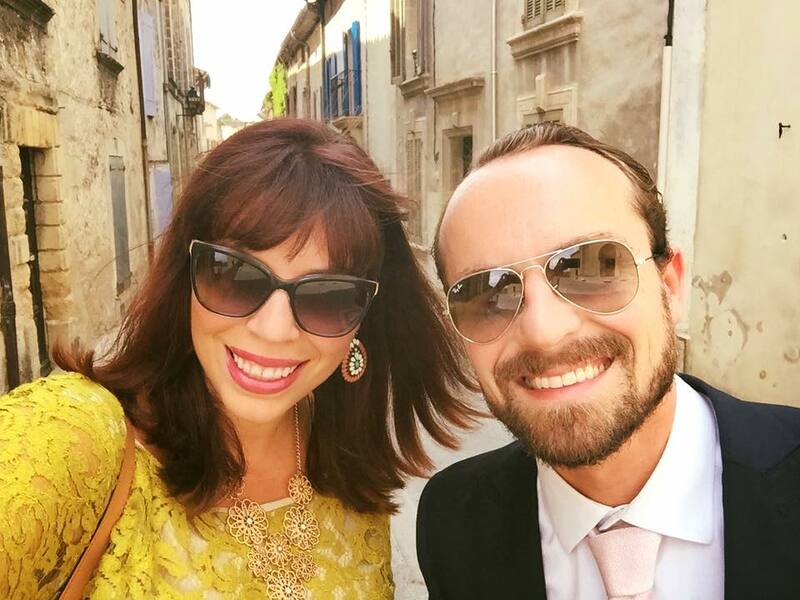 I am all for a wonderful wedding and theirs was such a celebration with close friends and family, I am in love with the French more than ever before :). Benvenuta allora! Great blog, wonderful photos. Congrats and much good fortune to the lovely couple. BTW: your hair style/cut is fabulous and looks so perfect for you. 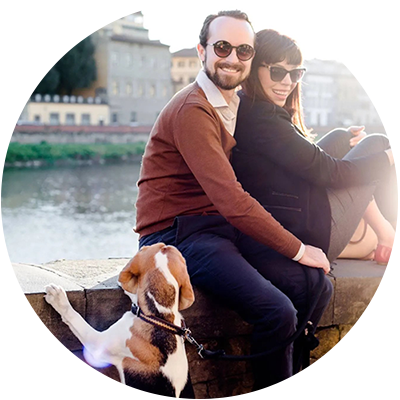 Would love to know your hairdresser he/she located in Florence.